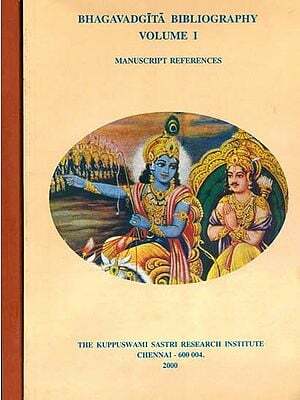 I have great pleasure in writing a Foreword to this detailed survey, in Sanskrit, of the Adavita literature, prepared by R. Thangaswami, Lecturer in the Department of Sanskrit, who is a good traditional scholar familiar with modern research methods. He has had free access to the rich bibliographical literature in the New Catalogus Catalogorum section of the Department, and has made use of it. He has tried to correlate the traditional lore with the modern approach, though his sympathy is generally towards the former. The work is written in lucid and chaste Sanskrit. It is a pioneer work of its kind in Sanskrit and I hope that it will be favourably received by the lovers of Sanskrit as well as the students of Indian philosophy. When we published the revised edition of the Slokavarttika with Umveka’s Commentary, we were very strict with regard to the uniformity, and followed the style sheet scrupulously. I wish it had been done here also. When I see the printed formes before me, I feel that as the Head of the Department I should have gone through the work before sending it to the Press and helped the author to see the proofs at some stage. 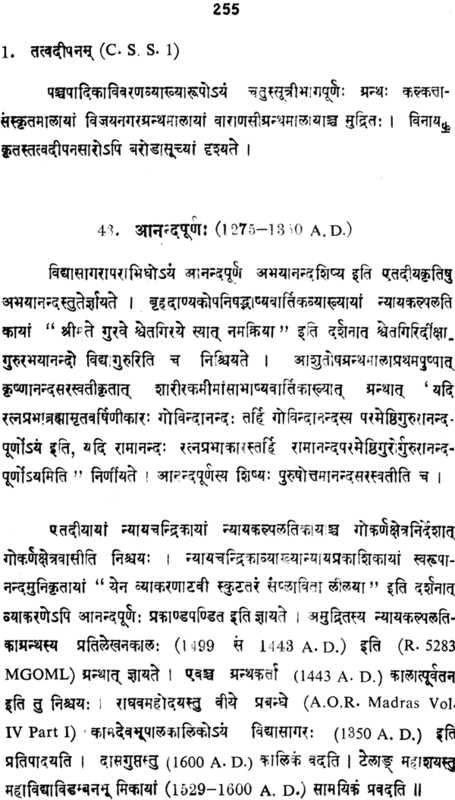 The use of anusvara before vowels, proper spacing of words, and avoiding of mistakes like simha for simha and sasthi for sasti could have been effected. While trying to combine the traditional stories with modern views, there has been some confusion between eponymous authors and historically known writers. Astavakra, Jambavan, Dattatreya and Sanatsujata appear in the same way as Samkara and Madhusudana Sarasvati. While discussing the dates stress could have been given to the available evidence rather than to the view of scholars. For a discerning reader this may not pose any problem. 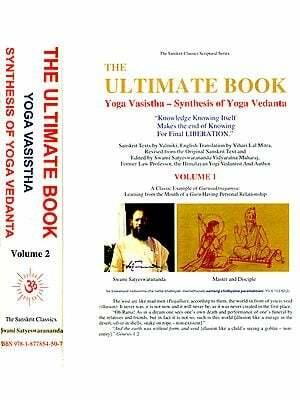 The first 113 pages of the book are devoted to the Prasthanatraya, then 833, Prakaranagranthas, 41 works known only from references and 471 anonymous works found in the various libraries are dealt with. The second part deals with about 500 writers on Advaita, their date, life and works. 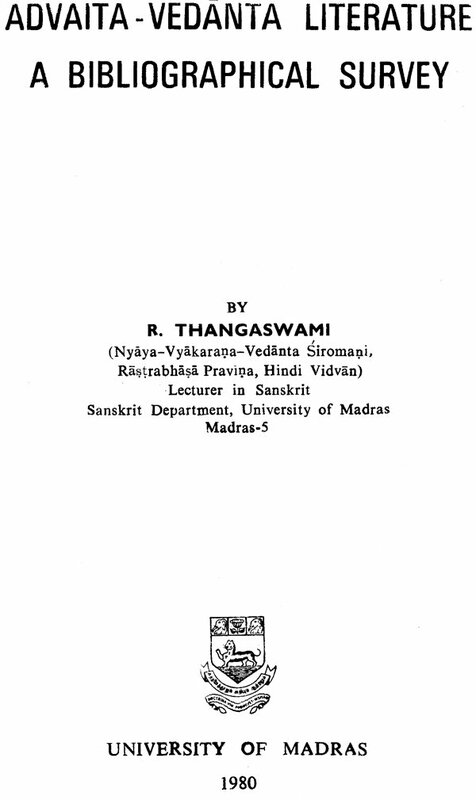 The detailed Introduction gives an excellent resume of the philosophical ideas in the basic Advaita works. Such a book is not available in Sanskrit and I am sure that the traditional scholars will specially welcome this venture. 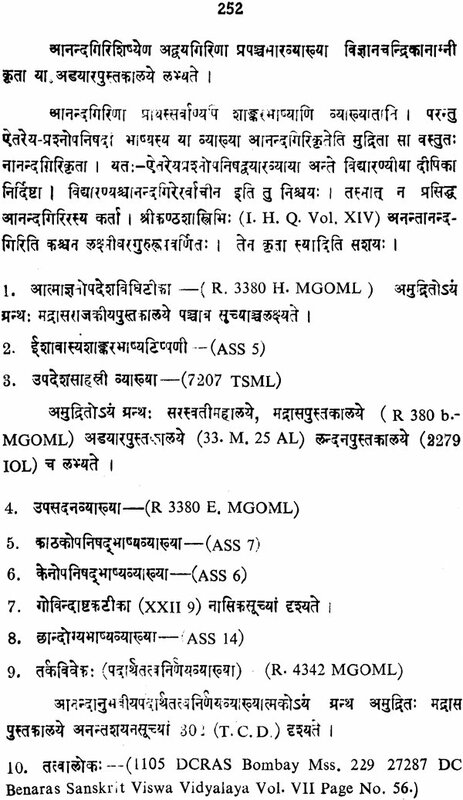 The growth of Literature on Advaita Vedanta can be treated in relation to the following periods- Ancient, Mediaeval, the late mediaeval and the present one. Of these the former extends upto the times of Sri Sankara and his contemporaries. In the works of these preceptors the basis for the doctrinal differences within the fold of Advaita such as the Vivarana view and the Bhamati view is found. During this period many independent works on Advaita were composed. The mediaeval period represents the growth of independent works chiefly concerned with a critical analysis of the Nyaya-Vaisesika school. According to Advaita, Brahman is the sole reality. Everything, else is false. The entire world appears in Brahman like silver in a piece of shell. Brahman is attributeless and so it cannot be primarily signified. The Upanisad-s, therefore, state that Brahman transcends both speech and mind. Attributes like omniscience, etc. too are adventitious in Brahman. Jiva in its essential nature is identical with Brahman. Yet, owing to avidya it appears as if different from Brahman. Everyone has the cognition ‘I’ and it is due to the limiting adjunct mind. In the state of deep sleep, however, mind provisionally merges in avidya and hence there is no cognition of ‘I’ in that state. In the same manner, in the state of liberation too there is the absence of the cognition ‘I’ in view of the absence of mind then. Thus the cognition ‘I’ is only adventitious. The ‘I’ is the empirical jiva, and its essential nature it is one and not many. The essential nature of jiva is pure consciousness; it is all-pervasive; it is designed by the term Atman. It is three-fold as Isvara, jiva, and saksi. Ajnana or nescience is the primal cause of the entire world. Atman associated with ajnana is termed Isvara. The latter is designated as Visnu, Brahma and Siva owing to the preponderance of the strands of sattva rajas, and tamas respectively. Atman is of the nature of knowledge. It is not an agent. It becomes a knower owing to its association with mind. The world becomes an object of knowledge only through avidya. Three levels of reality are admitted, absolute, empirical, and apparent. Of these, the apparently real object like shell-silver is removed by the knowledge of the empirically real object- the shell. Pot, etc., are empirically real. And, these are annihilated by the immediate knowledge of Brahman or Atman which is absolutely real. For Brahman there is no sublation at any one of the three divisions of time-past, present, and future. Hence it is absolutely real. Pot, cloth, etc, are real only provisionally. Really they are non-real like the objects of the dream state. The objects of the dream state do not exist in the state of waking. Hence they are non-real. In the same way, pot, etc., do not exist from the stand-point of absolute. Hence although they appear to exist, they are not real. They are annihilated by the direct knowledge of Brahman which is absolutely real. 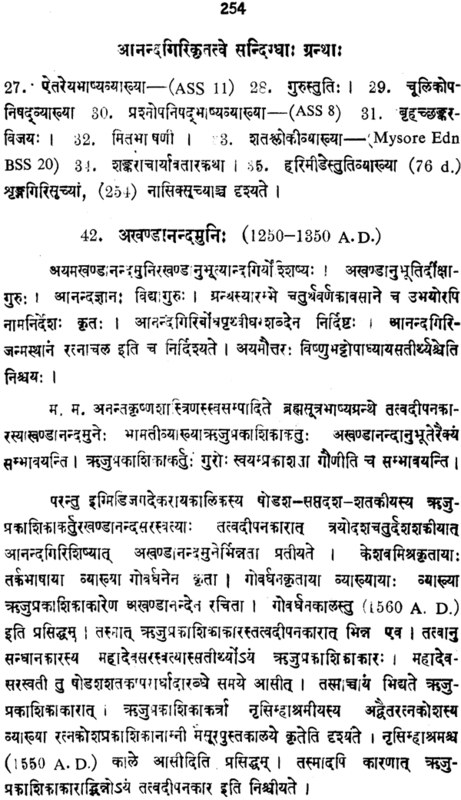 The order of creation of the fundamental elements mentioned in one set of Upanisad-s is different from the order mentioned in another set of Upanisad-s. Some texts speak that creation proceeds in the order of space, etc., while certain other texts state that it proceeds in the order of fire, etc. 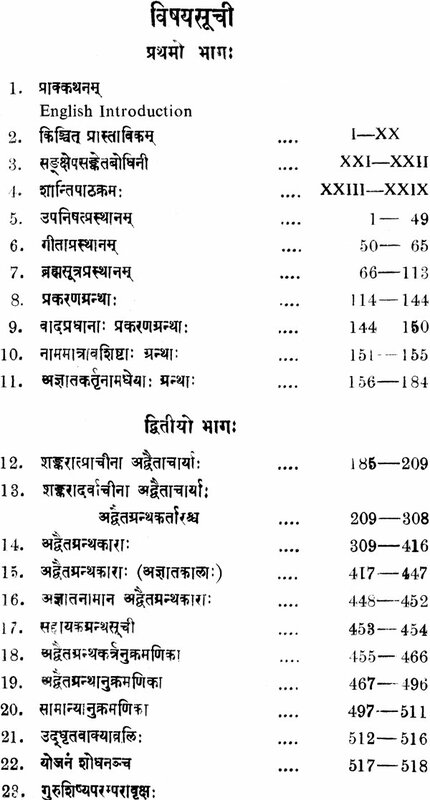 Yet another set of Upanisadic texts states that everything is Brahman. All the texts are valid and hence the apparent contradiction among them must be resolved. It comes to this that Brahman alone is real and the world of objects being non-real, the Upanisadic texts do not have creation as their final import. Moreover, if the world were absolutely real, then the Upanisadic text which states that nothing exists apart from Brahman would become non-significant. The world is real from the stand-point of the ignorant. From the stand-point of the realized soul, it is non- real. The Upanisad not only speaks of the non-reality of the world; it speaks of its non-reality too. The primal cause of the entire world is beginningless nescience. It consists of the three strands of sattva, rajas, and tamas. When the dissolution is about to end, the supreme self, that is Brahman, associated with avidya and aided by the merits and demerits of the individual souls contemplates thus ‘Let me become many.’ Then proceeds creation in the order of space, etc. Then from the quintuplicated elements spring forth physical body, etc. And, Atman which is pure consciousness gets reflected in the physical body and it is designated as jiva. The latter is not atomic in size; it is pervasive, as there is the experience of happiness and misery present throughout the body. The jiva-hood endures till liberation is attained. The jiva, like the one who has forgotten the golden ornament round one’s neck, experiences transmigration by having lost sight of its identity with Brahman. The three factors namely, nescience, subtle body, and gross body constitute the limiting adjunct; the latter is always proximate to jiva. The limiting adjunct is removed by the knowledge of the Atman, that is, the knowledge of the identity of the true nature of the individual soul and God. This is similar to the removal of ignorance in the case of one who has lost sight of his true nature of being a tenth man by the knowledge arising from the sentence ‘you are the tenth man’. Never indeed is it noticed that erroneous knowledge gets itself removed without the true knowledge of the substratum. Thus when avidya is annihilated the so-called jiva becomes liberated. In his case the fire in the form of knowledge removes the accumulated and the future merits and demerits. The fructified merits and demerits alone operate at this stage. The jiva experiences the fruits of fructified merits and demerits without any feeling of identity with the body, sense organs, and mind. He is termed jivanmukta. When the fructified merits and demerits are exhausted, the body falls off and he remains as Brahman; and, this is known as videhamukti. The latter alone is the supreme form of liberation. Herein, the so-called jiva attains what is known as absolute identity with the supreme self. In other words, it remains non-different from Brahman. The jiva does not remain as a servant of God as in some other systems. Although jiva is always identical with Brahman, yet owing to the influence of ajnana which is positive in nature, it considers itself to be an experiment of happiness, and misery. It is designated as ‘bound’. When ajnana is removed the jiva is designated as ‘released’. One has to perform one’s allotted duties as an offering to God. There results purity of heart. Then one resorts to a preceptor who is devoted to Brahman, and who initiates him into the major-texts of the upanisad-s. He lives the life of an ascetic, gives up the performance of Karma, pursues vedantic study, reflection, and meditation, attains the knowledge of Brahman and is liberated. In order to attain liberation, knowledge is the sole means. Performance of Karma and meditative worship on the conditioned Brahman give rise to purity of heart and concentration of mind which are essential for the rise of the knowledge of self and hence they are the indirect means to liberation. Combination of jnana and Karma is not accepted as the means to liberation. Ascertainment of what is real and what is non-real, detachment towards enjoyment of objects here and in a hereafter, acquisition of the qualities of control of mind, control of external senses, etc., and intense desire for liberation-these constitute what is known as the four-fold aid. Then follows enquiry into the nature of Brahman. On the epistemological side, Advaita admits what is known as anirvacaiyakhyati to explain the nature of error. Perception, inference, comparison, verbal testimony, presumption, and non-apprehension are the six proofs. In regard to Brahman which is extra-empirical, verbal testimony is the primal source. Perception, etc, are pramana-s only in regard to empirically real objects. The well-known verse that summarizes the teachings of Advaita is : ‘Brahman is the reality; the world is non-real; and jiva is not different from Brahman’. The doctrine of Advaita have been virulently attacked by the Nyayavaisesika school which advocated the reality of difference and by the Purva-mimamsa school represented by Salikanatha and others. 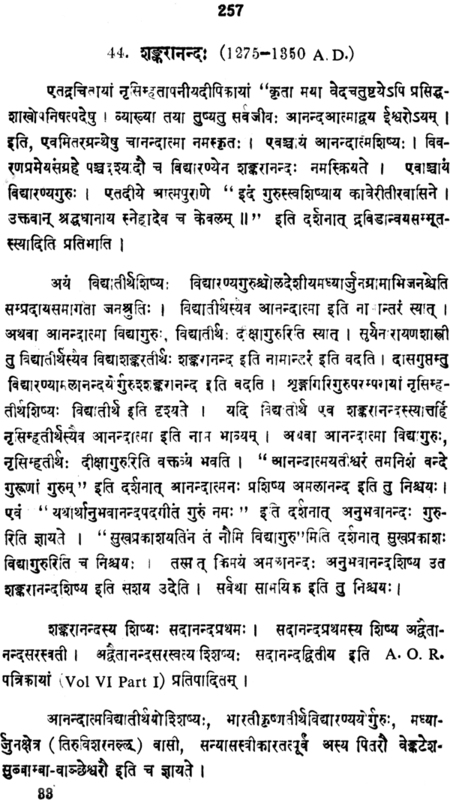 During the 13th century Sri Madhvacarya the chief expounder of the Dualistic school became one of the opponents of Advaita. In order to defend Advaita against the attacks of the above-mentioned schools, works like the Tattvapradipika, Nyaya-makaranda Nyaya-dipavali, Pancadasi, khandana khanda khadhya were written. Their chief aim has been to defend Advaita purely on rational grounds. The style of the text however differs. The Tattvapradipika, Nyaya-makaranda and other texts do not involve much of the technicalities of the navya-nyaya. But the text Advaita Siddhi and its commentary famously known as Brahmanadiya abound in logical subtleties to refute the doctrine of difference advocated by the dualistic school. The advocates of the dualistic school raises the powerful objection that if the world were admitted to be illusory then it would be an absolute nothing. Just as shell-silver is an absolute nothing, in the same way, the world too would be an absolute nothing. If this were the case, there would be the impossibility of the conduct of worldly activity and also the function of pramana-s. Moreover the knowledge of reality admitted to be derived from scripture would also be illusory. It is because the entire world of objects is admitted to be illusory by the Advaitins. The scripture too is included in the world of objects and hence it is also illusory. It comes to this, that the knowledge derived from the scripture too is illusory. The above objection has been carefully analysed and ultimately rejected by the Preceptors of Advaita. What exactly is meant by the term asat? Is it an absolute nothing? Or, non- existence for a given period of time? It cannot be the former because the world which is given in perception, which is adapted to practical needs of life cannot be an absolute nothing. That alone is an absolute nothing which does not come within the range of one’s perception. The world comes within the range of one’s perception and hence it cannot be an absolute nothing. Nor can the world be treated as real. Never indeed perceptuality or adaptability to practical needs of life could serve as the criterion of reality. In that case dream objects would become real as they are perceived, Thus, the world is not an absolute nothing like the horn of a hare; nor is it real like the self. That alone is real which does not leave out its essential nature in the three divisions of time past, present and future. The world does not come within the sphere of the above definition and hence it is not real. Mithyatva or illusoriness is sadviviktatva- that which is distinct from reality; or, it is sadasadvilaksanatva- that is, that which is different from being both real and an absolute nothing. In the texts like the Nyayaratna-dipavali, Tattvapradipika, the Tarkasangraha of Anandagiri, the Pramanamala and other texts of Ananda Bodha, the definitions of mithyatva have been set forth, analysed and established on sound basis. 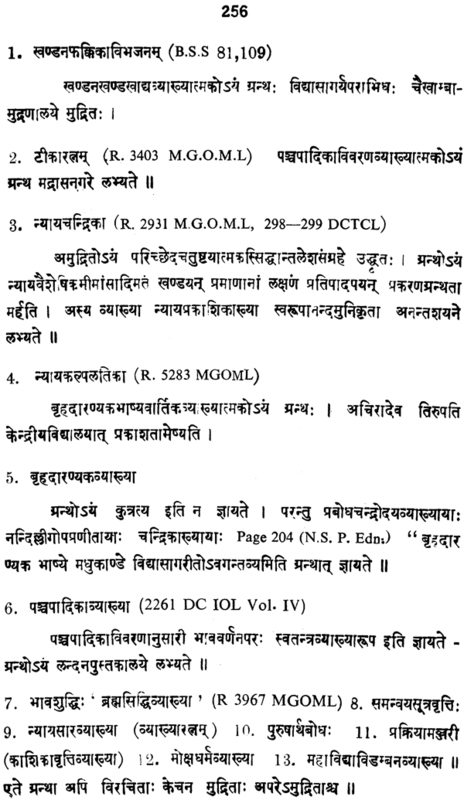 In the Brahmanandiya otherwise known as Laghucandrika five definitions of mithyatva are identified as one mentioned in the Pancapadika, the second and the third advocated in the vivarana, the fourth set forth in the Tattvapradipika and the fifth one referred to in the works of Anananda Bodha. It has already been said that the philosophy of Advaita is based upon the three texts of the Upanisad-s, the Bhagavad-Gita, and the Brahma-sutra. 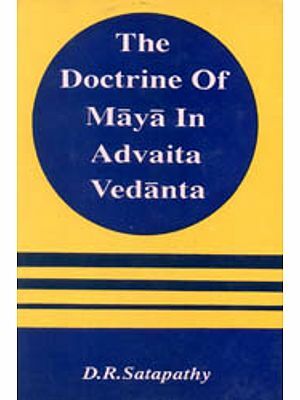 During the post-Sankara period doctrinal differences within the fold of Advaita developed to suit the needs of the aspirants of different levels of intellect. These doctrinal differences constitute glory to the system of Advaita. In the language of Suresvara any theory within the fold of Advaita is to be taken as valid if it facilitates the easy understanding of the concepts of Advaita ultimately leading to the realization of the non-dual self. Of these different schools within the fold of Advaita, the school of Bhamati and the school of Vivarana are important .